The MD 8000.1 1 OHMS amplifier is developed with the highest technology and performance for automotive sound systems. It is mono, with a maximum power of 8000Watts RMS with impedance of 1 OHMS, and 1 channel of 8000W RMS. Taramps HD3000 1 Ch 3000w RMS 1 OHM w/ US warranty! Max Output Power @ 12,6VDC - 1 OHM: 3000W RMS. Max Output Power @ 13,8VDC - 1 OHM: 3575W RMS. Max Output Power @ 13,8VDC - 2 OHMS: 2355W RMS. Max Output Power @ 13,8VDC - 4 OHMS: 1365W RMS. Max Output Power @ 12,6VDC - 2 OHMS: 2025W RMS. 5 out of 5 stars - Taramps HD3000 1 Ch 3000w RMS 1 OHM w/ US warranty! 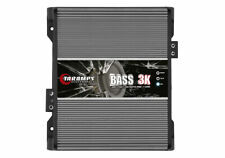 4 product ratings4 product ratings - Taramps HD3000 1 Ch 3000w RMS 1 OHM w/ US warranty! Max Output Power @13,8 VDC - 1 OHM: 1976W RMS @13,8 VDC - 2 OHMS: 1304W RMS @13,8 VDC - 4 OHMS: 751W RMS @12,6 VDC - 1 OHM: 1600W RMS @12,6 VDC - 2 OHMS: 1066W RMS @12,6 VDC - 4 OHMS: 620W RMS. Reference DSP 1600 - 1 ohm. Trending at $249.00eBay determines this price through a machine learned model of the product's sale prices within the last 90 days. Trending at $175.00eBay determines this price through a machine learned model of the product's sale prices within the last 90 days. Trending at $462.08eBay determines this price through a machine learned model of the product's sale prices within the last 90 days. Authorized Dealer - Taramp's Eletronics. Referência HD3000 - 2 OHMS. Potência de saída máxima @ 13,8 VDC - 2 OHMS: 3598W RMS. @ 13,8 VDC - 4 OHMS: 2446W RMS. @ 13,8 VDC - 8 OHMS: 1403W RMS. @ 12,6 VDC - 2 OHMS: 3000W RMS. The BASS 8k amplifier module, is carefully designed with the highest technology, and high performance for automotive sound systems focused on subwoofer and bass response. 8000 WTS MONO BLOCK 1 OHM STABLE CAR AMPLIFIER. MAXIMUM POWER@ 14,4 VDC - 1 OHM: 3000 W RMS. OUTPUT IMPEDANCE1 OHM. EFFICIENCY80%. WEIGHT2,96 Kg. MAXIMUM CONSUMPTION IN SINUSOIDAL SIGNAL260 Amp. MAXIMUM MUSIC CONSUMPTION130 Amp. CONSUMPTION AT REST1,10 Amp. Trending at $289.49eBay determines this price through a machine learned model of the product's sale prices within the last 90 days. Reference BASS 400. Max Output Power @ 13,8 VDC - 2 OHMS: 400 W RMS. Operation Class Class D. Crossover Low Pass (LPF) Variable 55 to 250Hz (-12dB/8ª). Number of Channels 01. Idle Consumption 0,5 Amp. Authorized Dealer - Taramp's Eletronics. Reference BASS 400. Input Sensitivity RCA: 320mV - WIRE: 6V. Max Output Power @ 13,8 VDC - 2 OHMS: 400 W RMS. Crossover Low Pass (LPF) Variable 55 to 250Hz (-12dB/8ª). 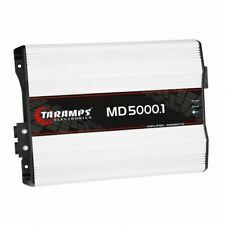 Taramps MD5000 5000W 2 Ohm 1 Channel Amp w/ warranty in the USA! The MD 5000.1 2 OHMS amplifier module, is carefully designed with the highest technology, and high performance for automotive sound systems. It is a mono amplifier and its maximum power is 5000W RMS with 2 OHMS impedance, and one 5000W RMS channel. 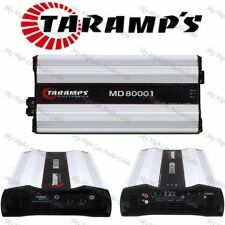 3 out of 5 stars - Taramps MD5000 5000W 2 Ohm 1 Channel Amp w/ warranty in the USA! 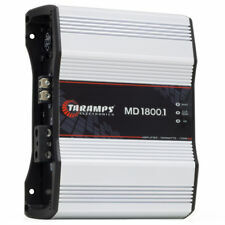 2 product ratings2 product ratings - Taramps MD5000 5000W 2 Ohm 1 Channel Amp w/ warranty in the USA! Channel Impedance: 1 Ohm. Amplifier Class: D. Total RMS Power Output: 3000 Frequency Response: 5Hz - 15000Hz. Number of Channels: 1 - Monoblock. Sinusoidal Singnal Maximum Consumption (A): 306 Total Harmonic Distortion (THD): 0.027%. 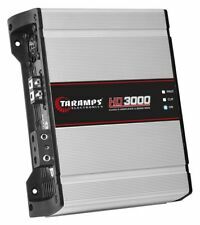 MD3000 – 1 OHM - Mono High Power Car Audio Amplifier- Authorized US Taramp's Dealer. Input Impedance 22K Ohms. Frequency Response 10Hz - 18Khz (-3dB). Weight 2.5Kg (5.5lb). MAXIMUM POWER @ 12.6 VDC - 2 OHMS: 5000W RMS. @ 12.6 VDC - 4 OHMS: 3200W RMS. CROSSOVER HIGH PASS (HPF) 10Hz ~ 90Hz (-12dB / 8th) Variable. CROSSOVER LOW PASS (LPF) 90Hz ~ 10KHz (-12dB / 8th) Variable. You will receive one BASS1200 1-ohm amplifier. The Bass 1200 Digital Amplifier Module is perfect for midrange systems with one or two subwoofers that add up to a maximum of 1200 Watts RMS. It has high performance and very low distortion, and its main differential is its response capacity from 8 Hz to 250 Hz. Authorized Dealer - Taramp's Eletronics. Max Output Power @ 12,6 VDC - 1 OHM: 3000W RMS. Reference MD 3000.1. Weight 2.5Kg (5.5lb). Input Impedance 22K Ohms. Frequency Response 10Hz - 18Khz (-3dB). The BASS 5k amplifier module, is carefully designed with the highest technology, and high performance for automotive sound systems focused on subwoofer and bass response. 5000 WTS MONO BLOCK 1 OHM STABLE CAR AMPLIFIER. You will receive one BASS 3K 1 ohm amplifier. @ 14.4 Vdc - 1 Ohm: 3000 W Rms. • Output Impedance: 1 Ohm. • Input Sensitivity: 220Mhz. • Crossover Low Pass (Lpf): Variable, 55 A 250Hz (-12Db / 8th). • Crossover High Pass (Hpf): Variable, 8 A 30Hz (-12Db / 8th). Reference HV 160,000 - 0.25OHM. Input Impedance 27K Ohms (RCA) / 54K Ohms (Balanced). Total Harmonic Distortion (THD) 0.2%. Input Sensitivity 360mV (With level at 100%) @ 0.5 OHM. Frequency Response -0.5dB ~ 10Hz at 15KHz. Max Output Power @ 12,6 VDC - 1 OHM: 5000W RMS. Reference MD 5000.1. Sinusoidal Signal Maximum Consumption 489A. Musical Maximum Consumption 244.5A. Idle Consumption 1.20A. Input Impedance 22K Ohms. Frequency Response 10Hz - 10Khz (-3dB). Musical Maximum Consumption 364,89A. Sinusoidal Signal Maximum Consumption 729,79A. Weight 6100Kg. Total RMS Power Output: 3000 Frequency Response: 8Hz - 250Hz. Channel Impedance: 1 Ohm. Amplifier Class: D. Number of Channels: 1 - Monoblock. Max Output Power @ 12,6 VDC - 1 OHM: 1800W RMS. Input Impedance 10K OHM. Sinusoidal Signal Maximum Consumption 182A. Musical Maximum Consumption 91A. Idle Consumption 1,7A. Frequency Response 10Hz - 20KHz. Reference DSP1800 HV - 1 OHM. Digital Signal Processing (DSP) 24Bits, 96KHz. Max Output Power @ 64 VDC - 1 OHM (5 Baterias em Série): 1800W RMS. Phase Selector 0/180°. Crossover High Pass (HPF) Full a 1KHz, 24dB/8ª Variável. INPUT IMPEDANCE10k OHMS. EFFICIENCY79%. WEIGHT1,395Kg. MAXIMUM CONSUMPTION IN SINUSOIDAL SIGNAL@ 12,6VDC: 120A. MAXIMUM MUSIC CONSUMPTION@ 12,6 VDC: 60A. CONSUMPTION AT REST900mA. MAXIMUM POWER@ 12,6 VDC - 1 OHM: 5000W RMS. OUTPUT IMPEDANCE01 OHM. INPUT IMPEDANCE22K Ohms. EFFICIENCY81%. BASS BOOST0 ~ 10dB (50Hz) Variable Frequency (35 ~ 55). MAXIMUM CONSUMPTION IN SINUSOIDAL SIGNAL489 A. Authorized Dealer - Taramp's Eletronics. Max Output Power @ 12,6 VDC - 2 OHMS: 3000W RMS. @ 12,6 VDC - 4 OHMS: 1920W RMS. Input Impedance 22K Ohms. Reference MD 3000.1. Weight 2.5Kg (5.5lb). Frequency Response 10Hz - 18Khz (-3dB). Max Output Power @ 12,6 VDC - 4 OHMS: 1800W RMS. @ 12,6 VDC - 8 OHMS: 1050W RMS. Line Linha MD. Reference MD 1800.1. Musical Maximum Consumption 85A. Idle Consumption 1,5A. Input Impedance 10K OHM. Frequency Response 10Hz - 20KHz. *US SELLER* Taramps M1 Led Clip Monitor Amplifier Tracker Remote *Priority Mail. Condition is New. Shipped with USPS Priority Mail Flat Rate Envelope. NOTE: Item was shipped to me from Brazil in a plastic shipping envelope. This caused the BOX to get smashed in transit but caused no damage to the remote/monitor. Item will arrive in 100% brand new condition BUT IN A SMASHED FACTORY PACKAGING BOX. No damage to item. Just a heads up! It can be easily installed in any easy-to-view location such as the car dashboard and has rugged material in addition to state-of-the-art technology. Indications: ON / CLIP / PROT. Compatible with lines. Reference HD10000 - 2 OHMS. Input Sensitivity 250mV @ (-9,78 dBm). Line Line HD. Input Impedance 18K OHMS. Crossover High Pass (HPF) 5Hz to 50Hz(-12dB/Octave) Variable. Crossover Low Pass (LPF) 50Hz to 15kHz(-12dB/Octave) Variable. You will receive one HD15000 1-ohm amplifier. @ 13.8VDC - 1 OHM: 18,000 W RMS. @ 12.6VDC - 1 OHM: 15,000 W RMS. Input Sensitivity: 220mV @ -13.15dBm. They are famous for being excellent with bass as well as with voice. Trending at $987.00eBay determines this price through a machine learned model of the product's sale prices within the last 90 days. The BASS 400 amplifier module, is carefully designed with the highest technology, and high performance for automotive sound systems focused on subwoofer and bass response. @ 13,8 VDC - 2 OHMS: 400 W RMS. The BASS 1200 2 OHMS amplifier module, is carefully designed with the highest technology, and high performance for automotive sound systems focused on subwoofer and bass response. 14,4 VDC - 2 OHMS: 1200 W RMS. Max Output Power @ 12,6VDC - 2 OHMS: 800W RMS. Weight 1,08Kg. Input Sensitivity 250mV @ -9,78 dBm. Input Impedance 18K OHMS. Idle Consumption 900mA. Protection System Curto na Saída, Tensão Baixa e Tensão Alta. You will receive one MD1200.1 1-ohm amplifier. @ 12.6 VDC - 1 OHM: 1200W RMS. The MD Series is an evolution of the HD Series. This is an excellent deal: a top-quality, high power amp for a great price. The MD 3000.1 2 OHMS amplifier is developed with the highest technology and performance for automotive sound systems. It is mono, with a maximum power of 3000Watts RMS with impedance of 2 OHMS, and 1 channel of 3000W RMS. 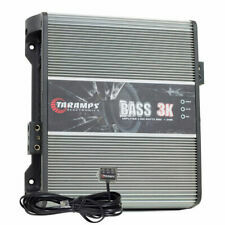 Taramp HD3000 3000W RMS Mono 1-Ohm Car Subwoofer Amplifier. 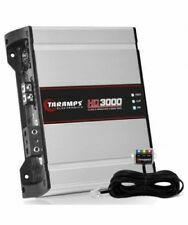 Taramp's HD Series 3000 Watts RMS Monoblock 1-Ohm Car Sub-Woofer Amplifier. Based on this concept Taramp developed HD 3000, an amazing and effective product that will amaze your ears.